It’s been a while since I last ran. 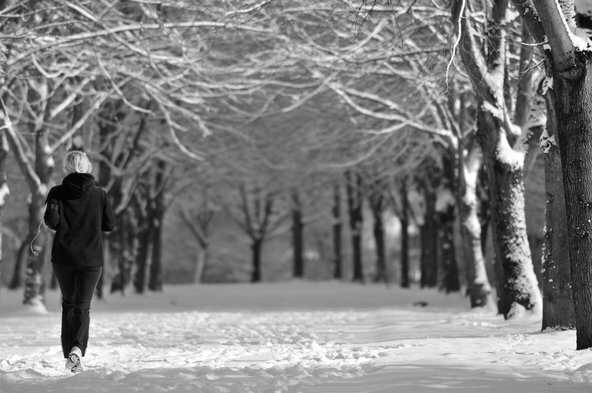 First, the 90 inches of snow in Boston made running miserable if not downright dangerous outside. I’m too cheap for a gym membership. I’ve been going to Longmeadow on weekends and am now staying there short-term (long story but I decided to sublet my apartment), so I planned to take advantage of the clean sidewalks, plowed roads, and quiet streets. I planned to start running last Thursday or Friday after work. Thursday morning, my boss and I went to get coffee not too long after arriving at work. I had already spent 2 hours in the car, and my first cup of coffee was at 5:30 a.m., so I was desperate. We took the back stairwell, which is cold, dimly lit, and often slippery from wet boots. However, this one was all my fault. I completely missed the last stair, and went flying to the ground. I landed hard and my ankle collapsed under my body weight. I felt a pop, and immediately started writhing around in pain. I was scared to look, but fortunately nothing was bent backward. I wasn’t sure I’d be able to continue on my journey for coffee, but I decided to try. Sure enough, it felt better the more I walked. However, by a few hours later, the pain was pretty bad. My ankle swelled up almost instantly, and was incredibly stiff. I’ve damaged this ankle more times than I care to count. My first month in Florida, I joined the University of Florida Competitive Cheerleading Team. I was warming up a roundoff – YES A ROUNDOFF (the part that comes after running but before any back flips) – and I rebounded really high because we were on a spring gymnastics floor. That means I landed on my feet, then launched back into the air like a pencil. When I came back down, my ankle collapsed beneath me – it was weak from previous injuries and I was really high, and the spring floor provided no support. It was bad. We all knew it. The pain was something I’ve never experienced before, even when I had broken my right ankle falling down the stairs (sensing a pattern here?) in high school, on my way to our cheerleading team photo. Not even doing anything athletic. Anyway, it turns out I tore all three ligaments in my ankle. It was black and the size of a grapefruit. My cheerleading career ended that night in Gainesville. It was probably time anyway. I was on crutches for two weeks. I was in physical therapy for two months. So when I fell, I had a flashback of this injury and the long road to recovery afterward. Fortunately, this time around wasn’t nearly as bad. Although, I’m older (by 7 1/2 years) and far less nimble now. By Saturday morning, the swelling was much better and it only hurt when I bent it, bumped it, or walked on uneven surfaces – which is pretty much every street and sidewalk in Boston. I’m still icing and elevating, but it’s just going to take some time before it heals, I think. I haven’t considered going to the doctor but might need to if it’s not better by next week. Needless to say, I can’t go running. I haven’t even worked out, because my usual workout is a full-body one. Also, I’m leaving the house at 5 a.m. and getting home between 7:30 and 8 p.m., so I’m usually pretty drained. I need to get back into a routine though, even if it means doing everything but lower body on my left side. With that said, the B.A.A. 5K is now less than two months away and I’ve done a miserable job at fundraising so far and have a LONG way to go to the $500 requirement and my $1,000 goal. Please consider making a donation because I WILL RUN THIS, even if it hurts and I’m slow and have to take breaks. 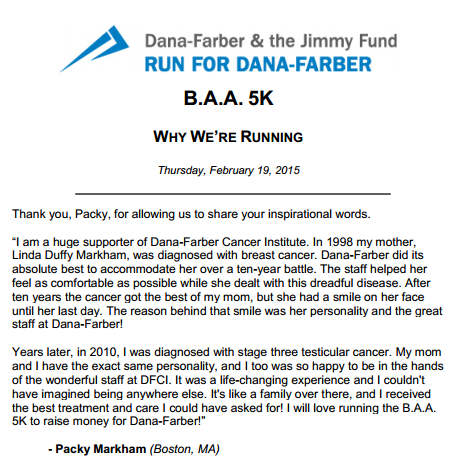 I realize the point of this blog is to keep everyone updated on my training and generate donations in my own name, but I’m always inspired by the reasons other Dana-Farber team members have decided to run – most of them are much more personal than mine. Guess what arrived on the same day? My B.A.A. 5K welcome packet from the Run For Dana-Farber folks, and my Garmin Forerunner 10 gps running watch showed up in my mailbox on the same day last week. Yipee! I’ve been eyeing that watch for a looooong time. It was on my Christmas wish list, but I didn’t get it. The price has been slowly but steadily dropping on Amazon for weeks, but I actually found it $15 cheaper from FactoryOutletStore.com, because it was a manufacturer-refurbished product. Honestly, you would never know. It looks brand new. It arrived last Friday, but I was headed to my mom’s for the weekend immediately after work. I charged it overnight there, and got all dressed and ready to go for a run on Saturday. It was 10℉, with the wind chill -8℉. Honestly, coldest run ever. I was so excited to test out the watch that I didn’t care. I ran out the front door, out of my mom’s parking lot, and up the hill. The sidewalks were snowy and icy, but I was wearing my new YakTrax and honestly, they made it like running on a sunny summer day on clear pavement. Uh-mazing! However, within about 30 seconds, my lungs were on fire. Every breath hurt. This was a new kind of hell I hadn’t experienced before and I decided it was so cold, the air in my lungs was probably turning to ice. My nose was running like a faucet, and the boogers were immediately freezing on my lips. I got to the top of the hill and decided I’d had enough. I turned around and walk-ran home. I literally made it 0.37 miles. I was crying, but not from sadness, just sheer misery. However, the watch worked like a charm. Later that day, I plugged it into my computer and was able to view the “run” (we can’t even really call it that, can we?) on the Garmin website, which automatically added it to my MapMyRun account. Pretty nifty! That was the headline in a New York Times blog post yesterday. I’ve always been a slow runner, and probably always will be. Running a 6-hour marathon would be my ultimate goal. Slow and steady wins the race (of life), people.